So I'm in Washington visiting family. While downtown, a random person asks to pet Vinnie and says, "You know, it really doesn't rain that much in Port Townsend. I'm actually surprised it's as green as it is." It never rains in San Diego. Further North in Los Gatos it rains sometimes. Further North in Corvallis is almost rains all the time. Further North in Port Townsend it must therefore rain all the time. Well... well... well... It turns out the random lady, who likes doxies, was right. I'll resist the urge to connect petting dachshunds with weather soothsaying given my recent record. The crazy part is that it rains LESS THAN HALF as much in Port Townsend compared to Corvallis. Well, now that I had the tool open, I opened a spreadsheet and started looking up cities of interest. 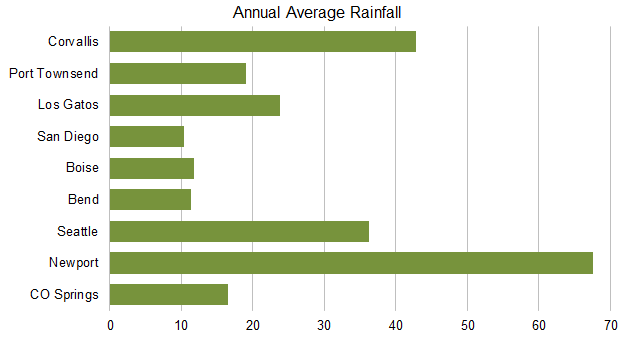 The chart below is total annual rainfall in inches. Ok. At this point, some of these look the same, but I think we can all agree that Boise is NOT the same as San Diego. Obviously a better picture would include temperatures, snow and/or sunny days, but that wasn't the claim I was investigating. I did want to get a better feel for how the average monthly rainfall looked. 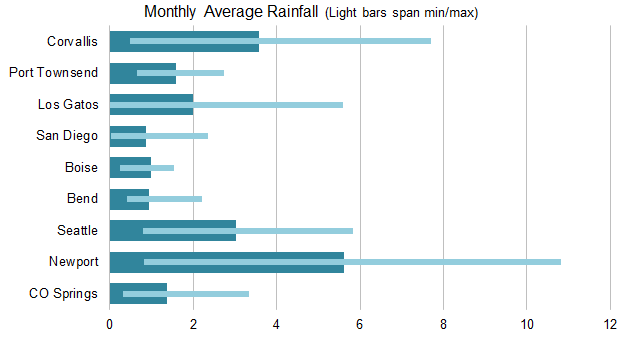 So the following chart shows the average in inches with bars that span the min/max amounts of rain in a month. 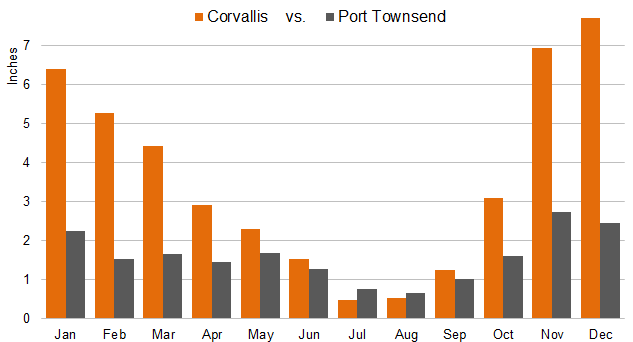 So it might rain less overall in Port Townsend, but there are some months when Corvallis gets less (take that!). And now for the series. This isn't for the faint of heart. I wanted to see the patterns. If you make it all the way to the end, you're in for a surprise in Colorado Springs. Most follow the same pattern (more in winter, less in summer) and this shows how extreme it gets in each place. 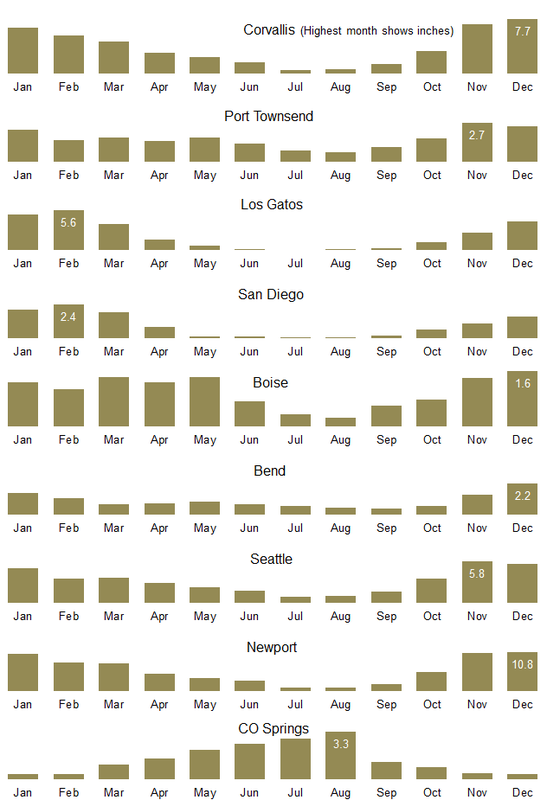 Surprisingly, there are months when it rains MORE in San Diego than Boise, but that's offset by lots of months with little, if any, rain. I'm not 100% sure, but I think Colorado Springs is broken. Hi James, This is really cool to see. (The math nerd in me coming out) For Colorado Springs, it's like here in Germany. The rainy season is in the Summer, because in the winter it is too cold to rain. During the summer we get big Thunderstorms that come and go quite regularly. Hope all is going well for you and Jessi! number of days with rainfall > 0.2" per month?